Spiceroute is the monthly in-flight magazine of Spice Jet, one of the largest domestic carriers in India. 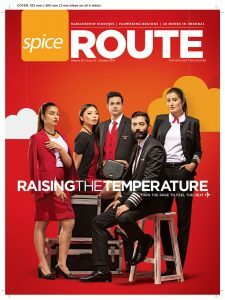 Spice route magazine is designed to appeal to the personalities and interests of Spice Jet’s passengers – young tech-savvy professionals, HNI individuals, Entrepreneurs, Students etc who travel frequently for both business and leisure. The magazine includes details of current happenings on the network, travel tips from experts, 48-hour travel itineraries, seasonal recreation guides, city tours by local personalities, restaurant write ups, the latest CD and movie reviews and quirky cultural insights – all served up in a spicy, colorful design. International: Bangkok, Dhaka, Dubai, Kabul, Male, Muscat, Sri Lanka. Exopic Media offers advertising solutions in SpiceRoute (Inflight Magazine of Spicejet). For more details and advertisement related query, please write to us at info@exopicmedia.com, Or you may also call us at +91-7678237402.